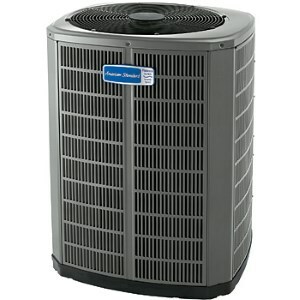 The Gold 17 heat pump from American Standard is a long-lasting, reliable product designed to be a good solution for customers looking for a quality product at a good price. You can add your Gold 17 to a complete American Standard HVAC system including furnace, air conditioner, and air cleaner to bolster performance and give you comfortable heating and cooling all year long. Your new Gold Series 17 heat pump gives you a non-Freon type refrigerant so it’s much kinder to the ozone layer. Both the heating and cooling processes can save you money on your utilities thanks to their efficiency and that efficiency also translates to reduced greenhouse gas impacts. One of the concerns in recent years has been the use of Freon in cooling devices like air conditioners and heat pumps. Freon comes from a class of chemicals called chlorofluorocarbons that have been banned by several international organizations or conventions like the Montreal Protocol and the Kyoto Protocol because they have a damaging effect on the ozone layer. They were considered to be so toxic they were called super-greenhouse effect gasses. Finding a way to cool your house without Freon is a definite bonus, and the Gold 17 can deliver. The two-stage compressor also means you get two stages of cooling. It operates at 70% capacity on a regular basis, moving to the second stage only when it gets hotter and you need that extra cooling power. It does this by continually making tiny adjustments to your heat pump’s operation so your home stays at a constant temperature. Those wide temperature swings you remember from your old appliances are a thing of the past. Those two stages of the compressor also mean quieter operation than some competitors offer, with a range between 72 and 74 decibels. The fan only operates on one speed, unlike the Platinum series American Standard models, hence the louder operation on a consistent basis. Platinum models can range from 59-72 decibels, depending on what phase the compressor is in. An insulator in the Gold 17 helps reduce that noise, however, so you can still enjoy your backyard barbeques and not have to try to talk over your heat pump. The AccuLink main control board provides perfect connections between the parts of your heat pump system so you get the greatest comfort any time of the year. Your home will be then be welcoming and inviting no matter what celebration you want to have – or what Mother Nature has decided to do outside. The Duration two-stage compressor gives you years of solid service without worry thanks to the way it operates and the quality construction. The outer heat pump shell is crafted to match the durability of the compressor thanks to a rust-resistant finish on all of the exterior components, including the base pan and the zinc-coated screws that hold the case together. The base pan is also designed to resist cracking that occurs with the elements and time. The coils are made of a durable aluminum to prevent rusting as well as provide effective heat transfer. Louvered panels coated in an appliance-grade powder painted finish provide protection for the coils from the elements without interrupting the airflow. A 12 year compressor warranty and 10 year coil warranty mean your heat pump’s parts are covered for a long time. Just make sure you register your heat pump within the first 60 days after installation to protect that warranty. The Gold 17 heat pump is so energy efficient, it might actually qualify for a tax credit. Check with your tax accountant for more details on the credit, but no matter what, the 17 SEER cooling rating is one of the best in the business. Pair the Gold 17 with an American Standard furnace and get 9.6 HSPF heating efficiency in the wintertime for toasty warm rooms and more money in your checkbook each month. If the Gold 17 heat pump from American Standard sounds like the right heating and cooling solution for you, contact your local HVAC retailer for more details and to arrange to have a sales person come survey your home and your needs to make the right heat pump match.